In today’s competitive market, you understand the importance of delivering outstanding customer experience while improving service desk productivity and keeping costs low. Remote support solutions enable you to meet these objectives by allowing agents to connect to remote devices and computers, pull system diagnostics and push configurations to deliver personalized hands-on support. With these solutions, you no longer have to walk novice users through detailed recovery procedures or complex settings. 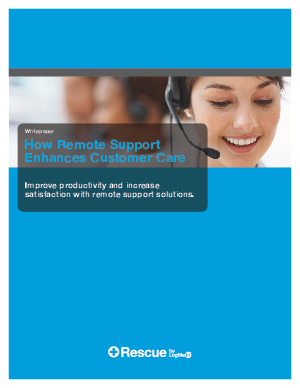 This white paper details how remote support solutions enable your organization to increase customer satisfaction, reduce costs by improving productivity, improve support metrics, and solve complex problems in a highly secure environment.